(April 30, 2012 –Brooklyn,NY) MaimonidesMedicalCenterannounced today that it has entered into a partnership with the Brooklyn Nets, and is now the NBA team’s official hospital and team physicians. To celebrate the partnership, the Brooklyn Nets donated official logo “onesies” to the Maimonides Payson Birthing Center. 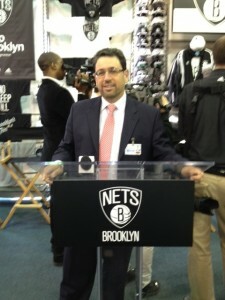 Every 2012 baby born at Maimonides, beginning April 30th, will go home representing Brooklyn’s new basketball home team. And since Maimonides delivers over 8,000 babies a year, that’s a significant number of new fans for the Brooklyn Nets! The team physician role means that Maimonides Sports Medicine experts will provide physicals and be right alongside the Brooklyn Nets players during all home games. For more information on Maimonides Medical Center’s outstanding clinical services, visit our website at www.maimonidesmed.org. Please send us your Maimonides Medical Center Becomes Official Hospital and Team Physicians of Brooklyn Nets questions or any questions to our friendly staff via our online Contact Form. You may also contact us at or visit our office at 6010 Bay Parkway, Brooklyn, NY 11204.